The Museum of Fine Arts (MFA) is one of the most impressive and beautiful cultural spaces I have ever visited. It is filled with objects and artworks from Asia, America, Europe, and numerous ancient cultures. There are constantly changing exhibitions meaning you could visit again and again without feeling as though you had seen it all before. In saying this, we spent over two hours at the museum and still felt as though we had barely scratched the surface of what was on offer. It was an absolutely exhausting experience trying to find our way around and see everything that was of interest. I am absolutely hopeless reading a map at the best of times. This map defeated me and we often found ourselves completely lost. In other words, we saw more of the museum than we initially intended. Apart from the map, which I do believe could be slightly improved and adjusted, our experience of the MFA was very enjoyable. 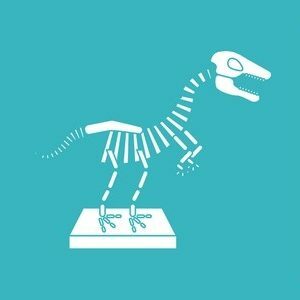 I would highly recommend anyone visiting Boston to have this museum on their “to visit” list. I am going to start by reviewing their new exhibition, Showdown! Kuniyoshi vs. Kunisada. It is located on the lower level of the museum in their special exhibition space. What I found great about this exhibition is it was quite fun and challenged the visitor to more closely assess and evaluate the artwork. 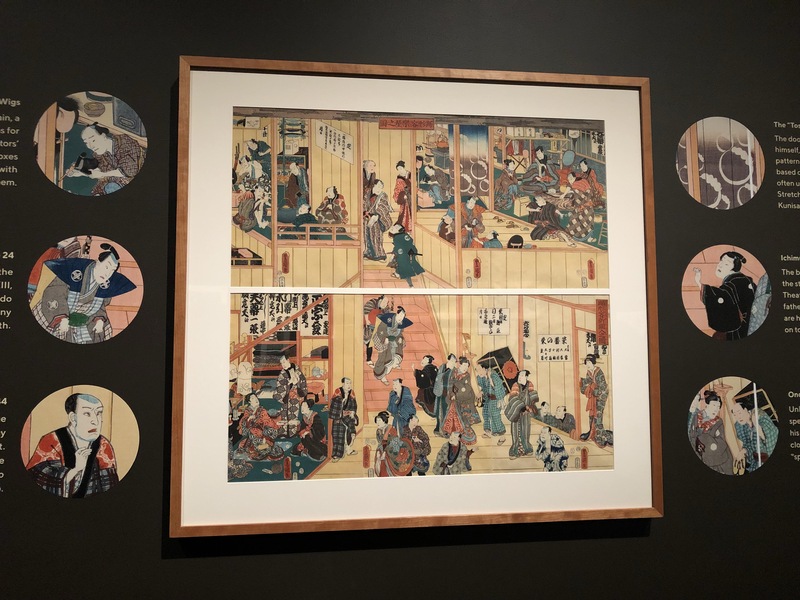 The introductory panel sets the scene – Kuniyoshi and Kunisada were rival woodblock print designers in 19th century Edo, now modern Tokyo. 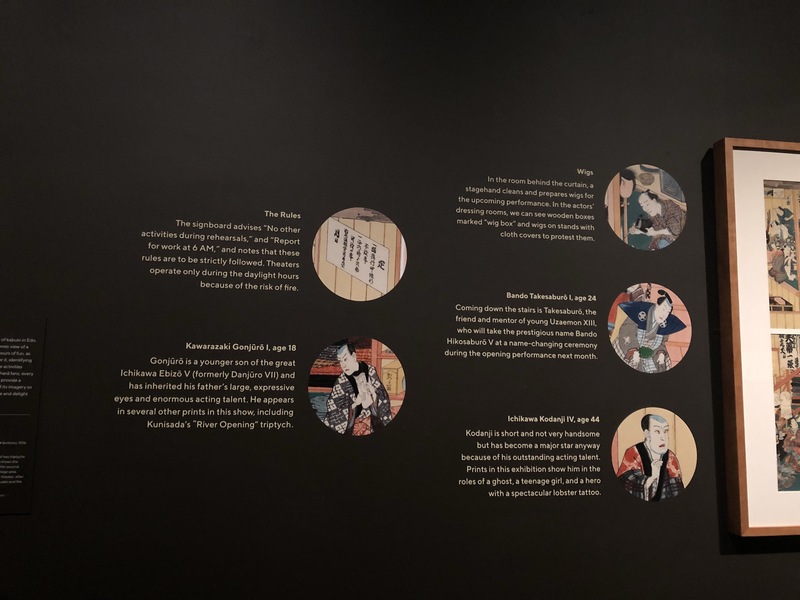 They created some of the most beautiful prints in Japan depicting people, most notably kabuki actors. The panel asks visitors to re-ignite the rivalry by the selecting which artist they prefer. 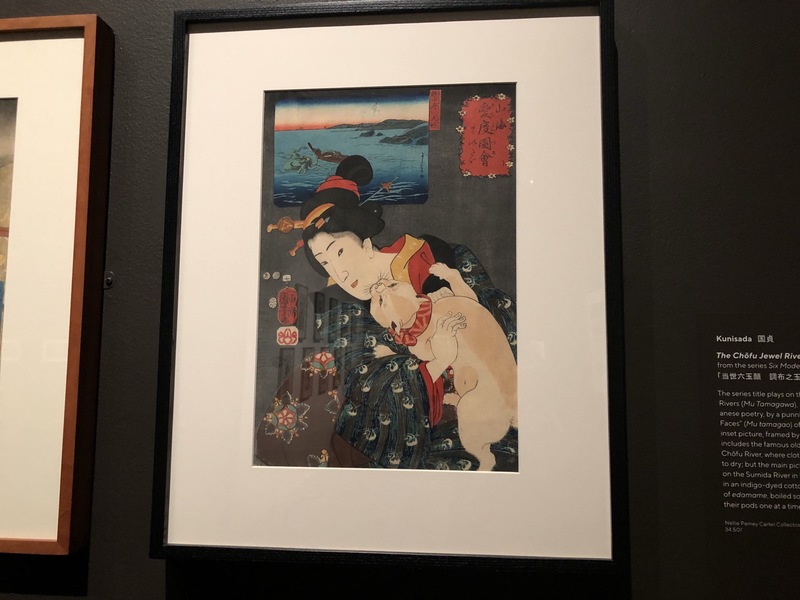 What worked really well was that all of Kuniyoshi’s works were framed in black and Kunisada’s in brown. This meant it was aesthetically very easy to see who did what without having to read through every label and remember all the details. With over 50 prints on display, this was a real positive. It also meant that the artworks could be easily merged together yet retain their artist’s identity. As similar themes were explored by both, displaying the works together was almost necessary, in my opinion. The prints themselves were so colourful and intricate. You could literally spend hours looking at one work finding all the hidden symbols and characters. One of the more intense pieces was interpreted by the Curators. On the wall next to the print, there were parts enlarged with further information. For example, faces were selected and identified, showing visitors who was in the print. I really liked how this was displayed considering it encouraged me to more closely look at the others. 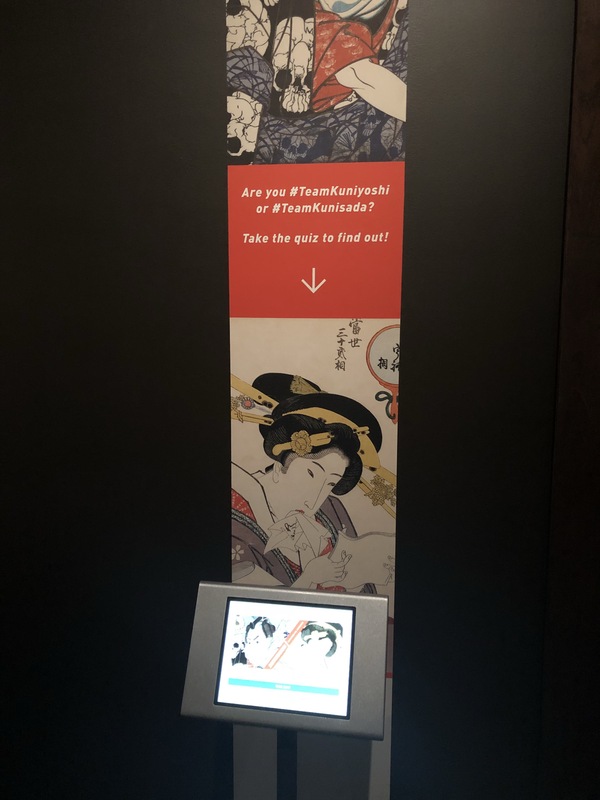 Finally, the exhibition had an iPad containing a quiz to discover if you were more like Kuniyoshi or Kunisada. Having this sort of “pick a side” feel to the exhibition was very interesting and I enjoyed how it wasn’t just a gimmick but did draw on a historical rivalry. This exhibition was one of the main reasons I wanted to visit. Walking around the rest of the exhibition spaces, I picked up some other great efforts made by the MFA. I will briefly cover these below. Juxtaposing the past with the present is something that I very much appreciate. Actually seeing inspiration from the past that has influenced something in the present can have great impact. 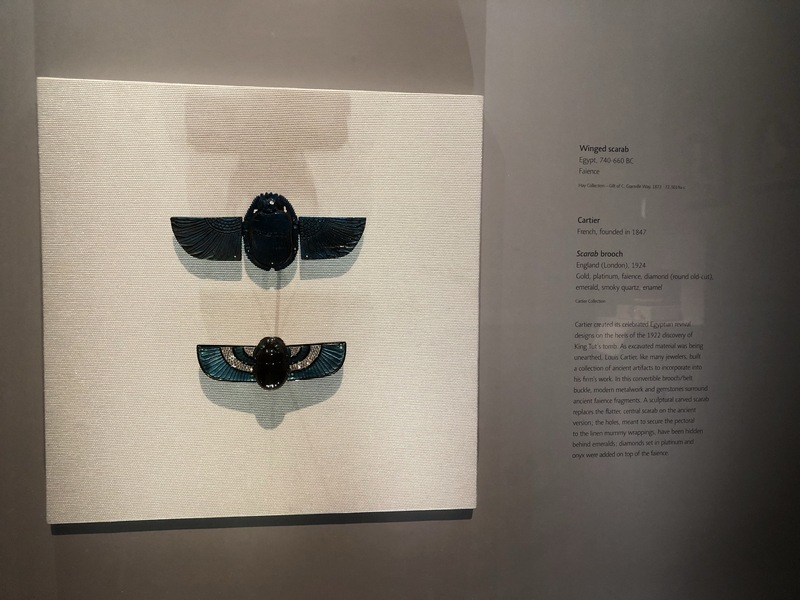 On entering the exhibition space, the first object you see is a winged scarab from 740-660 BC lying above a 1924 Cartier scarab brooch. Full disclosure, the exhibition is sponsored by Cartier so no surprise that one of their pieces featured. The rest of the exhibition was quite small, only containing around ten cases mounted to the wall and one large case in the centre. Most of the cases displayed ancient/early modern examples with their modern counterparts. There were some stunning pieces on display including a travel bracelet from 19th century Italy. The labels were positioned well inside the case but the font was quite small. 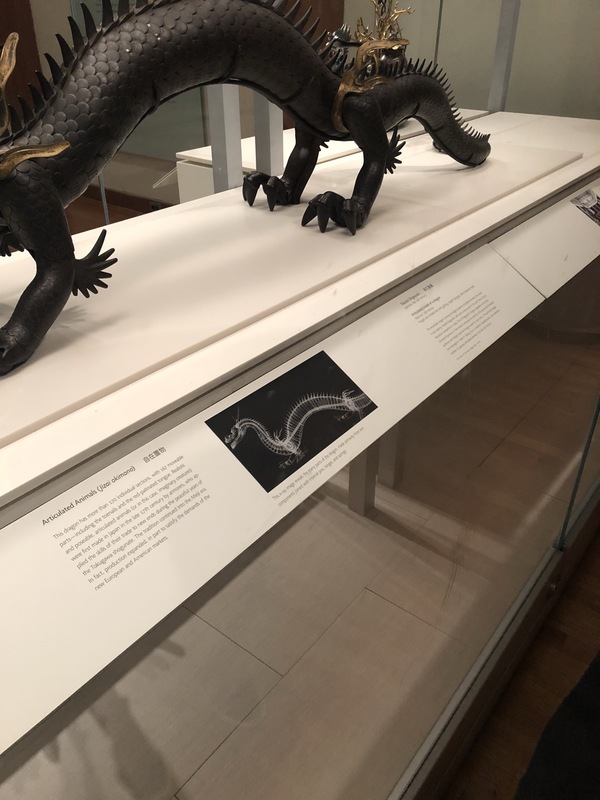 A trend I am seeing way too often in some museums. Something that I am always so interested in seeing are recent museum acquisitions. I don’t know why, it just makes me happy to see institutions still collecting significant objects. 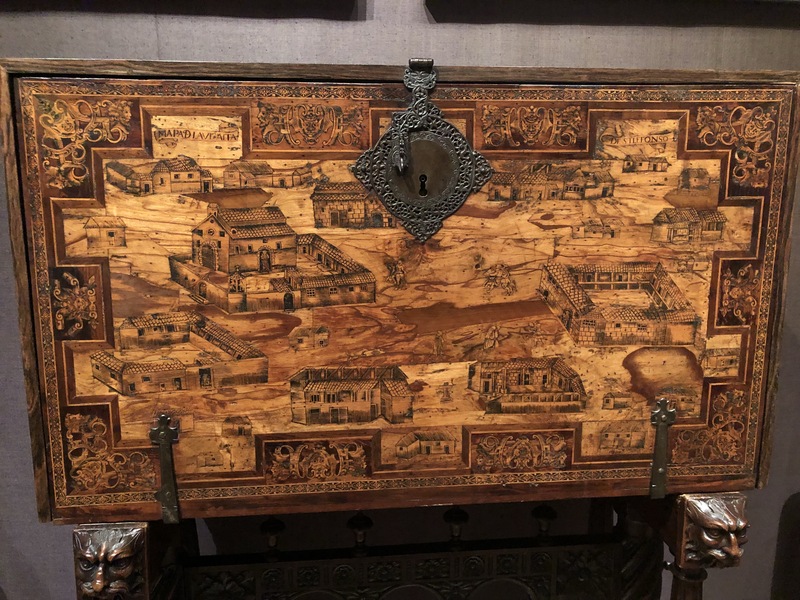 A writing table from Mexico immediately caught my attention. While reading about the desk I noticed a small red and white symbol on the label. On closer inspection, it was specifying that this object was a recent acquisition. 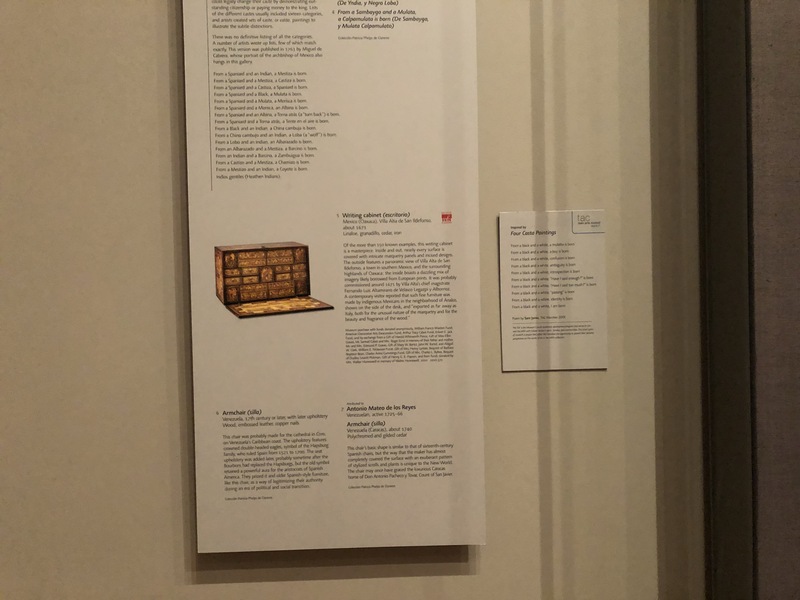 All of a sudden I went from being interested in the object to also being interested in how this recent acquisition had been worked into the existing display. I believe it added another layer of complexity and thought to the exhibition. 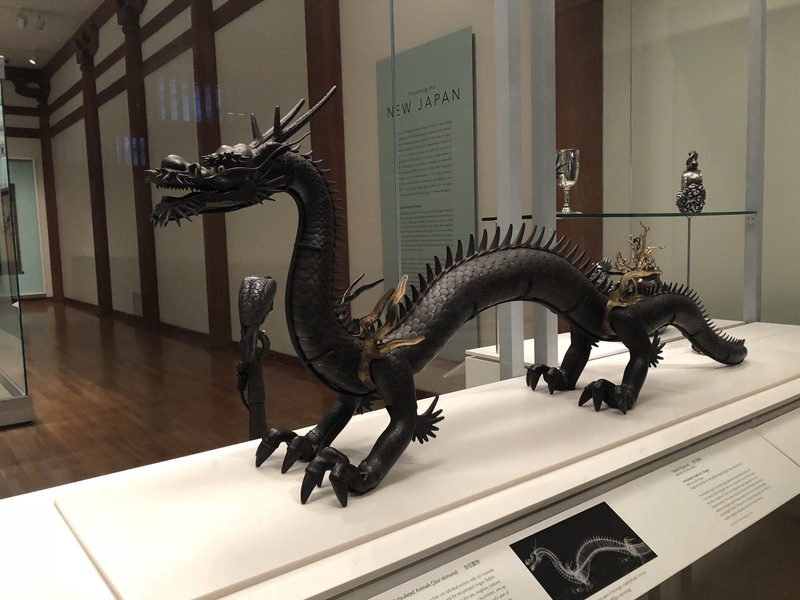 There was one object in the Art of Asia and Oceania that I found provided incredible insight into how much research is conducted on objects. Underneath this sculpture was an X-Ray image showing the internal parts and sections. It gave a new perspective and meant you could better see how it was put together. 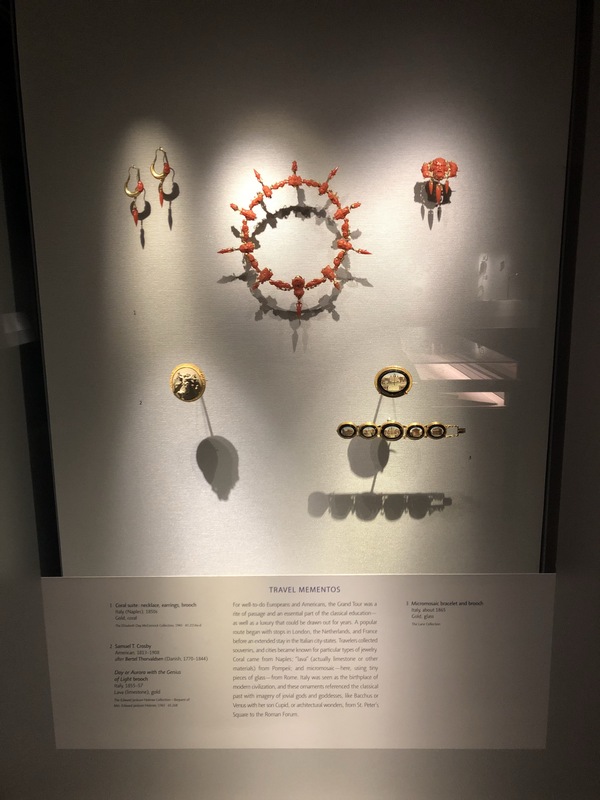 The fact that modern technology can now be used to shed new light on ancient objects was highlighted and added to the object’s story. We were overwhelmed by how much was on display in this museum. After two hours we reached maximum capacity. It would be great to return again to see the new temporary exhibitions and more of the permanent display. The museum also has an amazing contemporary art collection that we did not have time to visit. Considering we will soon be at the Philadelphia Museum of Art, we didn’t want to wear ourselves out too early in the trip.